If you're traveling to Ottawa, VroomVroomVroom can help you find a reliable car rental to help you get around. We have partnered with the country's leading car rental companies such as Alamo, Avis, Budget and Enterprise to make sure you are getting a great deal. Ottawa is the capital of Canada, and has plenty for visitors to see and do. It is one of the least expensive cities to live in Canada according to Mercer Human Resources Consulting, and Forbes has rated Ottawa as the fourth cleanest major city in the world. Why book a rental car in Ottawa with VroomVroomVroom? Book your next car rental with us to enjoy several benefits. Here are some of the main reasons why customers book with us. Great rates: When you book with VroomVroomVroom you can access the best car rental rates. Make sure to read our Price Promise to find out more information. Convenience: If you are you flying to Ottawa, you can also find great car rental deals at Ottawa Airport. Wide selection of cars: It is easy to find a specific car since we list down all available vehicles from our car rental partners. Security: When you book your car rental with us, rest assured that your information is protected by our site's SSL encryption. Trusted since 2001: We are the experts in rental cars. Contact us today if you have any queries. You may also leave us a message on Facebook and Twitter. Do you love crowds? If your answer is yes to this question, then you'll find the perfect times to experience Ottawa are during the months of February, May, July and October. Normally, these months are considered the busiest as many tourists visit Ottawa to celebrate the Winterlude Festival held annually in February, the Canadian Tulip Festival held in May, and Canada Day held on the 1st of July. Summer in Ottawa happens between June to August. During these months, the temperature can range between 25 to 30 degrees. In winter, snow and ice are common, while spring and fall are variable and can be very unpredictable. But overall, the weather in Ottawa is enjoyable enough for tourists to appreciate the many wonderful attractions this city has to offer. If you are driving from Ottawa and also planning a trip to Montreal, the driving distance is approximately two hours through Trans-Canada Hwy/ON-417 E and Route Transcanadienne E/Autoroute 40 E via rental car. Served by two freeway corridors, the primary corridor in Ottawa is east-west and comprises of provincial Highway 417 and Ottawa-Carleton Regional Road 174; a north-south corridor, Highway 416, which connects Ottawa to the rest of the 400-Series Highway network in Ontario at the 401. Note that Highway 417 is also the Ottawa portion of the Trans-Canada Highway. If you are looking for some scenic parkways (or promenades), Ottawa has several of them. These include the Queen Elizabeth Driveway, Colonel By Drive, the Sir John A. Macdonald Parkway, Rockcliffe Parkway and the Aviation Parkway. Looking for fun in Ottawa? Planning a trip on your next vacation can take a lot of time, hence it's necessary that you know already when the weather is at its best, the popular attractions are at their least crowded, and the accommodation is at its cheapest before your holiday starts. In this guide, we listed down wonderful things that you can do and see in your reliable rental car when in Ottawa. Want to see all the major attractions in Ottawa? Then get on your bike! Escape Bicycle Tours and Rentals offers bicycle and electric bike rentals and guided sightseeing bicycle tours at amazing prices daily 9:00 am to 6:00 pm, May 1st to Oct 31st! Rental from $8 per hour to $28 per day (9 hours); guided tours from $45 to $99. 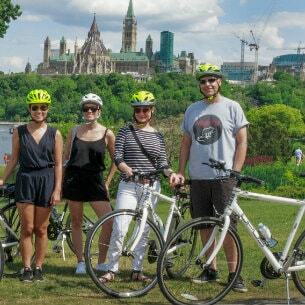 Explore Ottawa's major attractions, hidden gems and historic landmarks at a comfortable pace on safe and scenic bicycle paths with their guided tours or rental bikes and self-guided maps. You can enjoy their leisurely 2-hour, 3-hour and 5-hour tours from May through October. Check out their tour calendar and plan to join them for a memorable tour in Ottawa! Or simply drop by for bike rental. They take care of everything --- bicycles, helmets, route planning, water bottle, power bar snack, and friendly and knowledgeable guides! What are you waiting for? Stop to take memorable photos, enjoy a pit stop at a local cafe and experience the freedom of the open road! Ottawa Tasting Tours offers a four-course dining tour extended across four unique restaurants in Ottawa's ByWard Market. Guests experience a four-course dinner with each course of the evening being served at a different local restaurant in the heart of the nation's capital. Each course is paired with a hand-selected 3oz glass of wine. There are no additional fees while on the tour. Starting the tour in a hidden courtyard of the ByWard market guests gather and are introduced to their welcoming guide and/or registered sommelier. Our regular tours begin at 5:30 pm and guests are seated at their first restaurant shortly after. Courses and wine pairings are pre-ordered and pre-paid to provide guests with a V.I.P. experience. Because of the ByWard Market's distinctive layout the restaurants we have selected are no more than a block or two apart. While walking between each restaurant in the ByWard Market, guests are invited and encouraged to take in and experience Ottawa's rich history and unique culture. 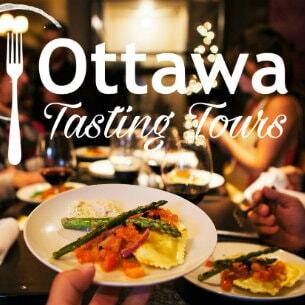 Ottawa Tasting Tours offers something for everyone – from local foodies to eco-tourists and all those in between. Wellington Street is one of the pedestrian focal point of Ottawa. The location dates back to the original settlement in 1826 and has since been one of the most important streets in the city. The main reasons for this come from its historical value, as well as from the numerous other establishments paving it. There are shops, restaurants, galleries and museums located on the Wellington Street, which are perfect for a full-day walking tour. 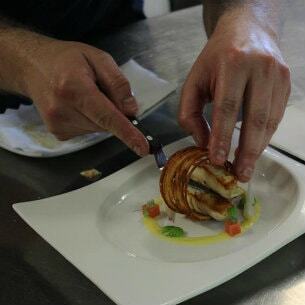 Ottawa has become a culinary destination with some of the country's most talented chefs. While many of its dinning establishments remains a mystery to most people outside the city, the quality of Ottawa chefs is well recognized within the industry. Come and try one of Canada's only molecular cuisine, be the guest of 2016's Canada culinary champion or 2017's Canada culinary champion runner-up, receive a drink from Canada's best mixologist, eat the best bean to bar chocolate in the WORLD!, or the third best gelato in the WORLD! You can do this and much more in Ottawa. And, what better way to discover this than with an Experience Food Tour. With Experience Food, you know you will be discovering the best restaurants in the city. Your private tour guide will teach about one of Ottawa's standout neighborhoods and bring you to eat at restaurants worth discovering, including many restaurants named in the Canada's Top 100 restaurants. With seven different neighborhoods to discover, you can decide to stay in the touristic areas and learn about their great restaurants or you can go off the beaten paths and eat with the locals. Join them for a four course meal complete with drink pairings during the second annual Field to Fork Gourmet Feast on a Top Secret Farm on August 26th 2017. Tickets are limited. If you enjoy a regional tour of local breweries, come along at Brew Donkey Tours. This tour features three breweries, an on bus education session on craft beer and the Ottawa scene and entrance to the Red Bull Rally Cross. They offer tours every throughout the year on weekends. The National Gallery of Canada is the most important establishment of its kind in Ottawa, in addition to many other specialized museums and galleries. The museum opened in 1988 and it stands to represent the most important and relevant Canadian values, traditions and beliefs. The contemporary art exhibits included here have been created by very famous names. Throughout the year, the museum takes its exhibits in national tours, so that all people can enjoy and admire them. The Château Laurier is a landmark of Ottawa. The massive construction was built here in 1912, gathering a long tradition and function as a hotel. The venue is still operable today and it offers people accommodated here a unique experience. Even those who do not reside in the hotel may admire it, as the grand architecture and the design should not be missed. Whitewater Rafting on the Ottawa River – Come paddle at OWL Rafting! Experience the thrill of a lifetime on the BIG whitewater of the amazing Ottawa River. Moving from the gleam of fast-moving clear water to the adrenaline rush, rumble and tumble of rapid action, spend the day paddling and finish with a great meal on our pontoon boat. Situated in Foresters Falls, Ontario, OWL Rafting is owned and operated by Claudia and Dirk Van Wijk, National and International Whitewater Champions. 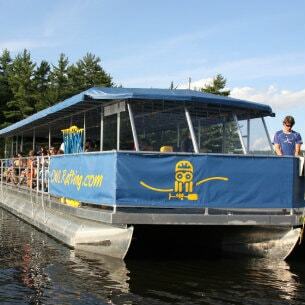 They offer raft excursions for everyone down the legendary 12 km 'Rocher Fondu' rapids of the Ottawa River. The OWL experience takes place just ninety minutes from the Nation's Capital. Excursions embark 7 days a week from mid May through September. What are you waiting for? Book an adventure with OWL Rafting today. Calypso Theme Waterpark is the coolest place to visit in the warmer months. Jump in your car rental and head east from the city about 20 mins and enjoy the largest water park in Canada with numerous water slides and other water activities. Chutes Coulonge Park is an adventure awaiting to happen. With extreme activities like a zip line and rock climbing, the family will appreciate your initiative to plan ahead and book a car rental. Are you ready to hit the waves for the most exciting ride of your life? Experience Ottawa-Gatineau like never before. 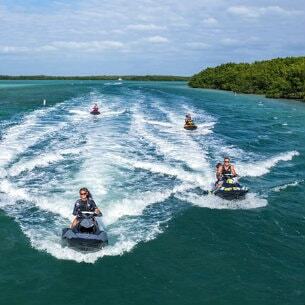 Jetski Ottawa offers all-inclusive Sea-Doo Jetski rentals and tours. They also offer the Flyboard jetpack experience for thrill-seekers! Never been on a Sea-Doo / Jetski ? No problem! Their accommodating friendly staff will provide you with everything you need to experience the ultimate adventure on the water. Jetski's facility is located at Petrie Island which is in the east end of Ottawa. Their prime location gives guests access to the entire stretch of the river - views of Parliament of Canada, prime ministers residence , Rideau falls, casino Lac Leany, downtown Ottawa, and the many islands that surround. No Boundaries X-Treme Adventures is the only customized Adventure Tour Company in the Eastern Ontario and surrounding area. They are a fully bilingual company based out of Ottawa, Ontario. They build trips and tours based on your level of adventure! Some of their most popular tours include bungee jump tours which take place at the Great Canadian Bungee, the highest bungee jump in North America, white water rafting tours on the Ottawa River, hiking and caving adventures, brewery and winery tours, and more. All you have to do is tell them what you like to do and leave it to them! Are you new to the city? Or just visiting? Ottawa Free Tours offer the BEST walking tours of downtown Ottawa. Since 2015, Ottawa Free Tours has been providing free (tip-based) walking tours of downtown Ottawa. Their passionate and expert guides love showing off Ottawa and will tell you about the captivating stories of Ottawa's colourful past, interesting landmarks and vibrant culture. When life brings you to Ottawa, live large at The Albert at Bay Suite Hotel. Why not stay in an apartment-sized suite for the same price as a cramped hotel room? Home to the largest suites in downtown Ottawa, along with incredible onsite facilities make up the exceptional value and convenience you're looking for in an all-suite hotel. Still looking for more? Their downtown location lets you savour the sights and sounds that make Canada's Capital truly stand out. Within walking distance are great attractions including world-famous Rideau Canal, ByWard Market, Parliament Hill and incredible world-class museums. If you are meeting with people in downtown Ottawa, why not meet with them first. Their flexible meeting spaces combined with highly personalized service will ensure your gathering a success. Situated just 10 minutes from downtown Ottawa, The Hampton Inn by Hilton Ottawa hotel is near all the action in Canada's capital city. Enjoying a vibrant mix of shops, restaurants, and cultural attractions, Ottawa provides numerous things to see and do. You may want to check outthe Parliament, Senate, and Supreme Court of Canada or view a collection at the National Gallery of Canada. Delight in a gentle stroll and picnic with friends and family, or try hiking, biking and cross-country skiing in Gatineau Park. St. Laurent Shopping Centre is conveniently located ated within walking distance from the hotel. Whether you are looking for the perfect place for your next business meeting or special event, discover the the perfect accommodation at the Hampton Inn by Hilton Ottawa. The Courtyard Restaurant is a beautiful venue for dinning during your vacation in Ottawa. The design and the atmosphere of the restaurant will enable you to enjoy the culinary experience even more. During the warmer seasons, the restaurant opens up a terrace. Special events and weddings can be hosted at the Courtyard Restaurant. Are you looking for a delicious meal in Ottawa and at the same time, do you want to experience great neighbourhood dining in a soaring yet intimate, converted 1950's bank building? Then book a table at Gezellig. (gah-zell-ig) is a Dutch adjective for convivial, cosy, or nice atmosphere, but also belonging, general togetherness, or time spent with loved ones... Gezellig aims to provide their customers extraordinary food & wine with fun, value and the same warm hospitality that they have become known for. Situated in the recently renovated Westin Ottawa, the Shore Club is right in the heart of Canada's capital city, and is just steps away from a number of attractions and historic sights, including the scenic Parliament Hill and Rideau Canal. Guests at The Shore Club whether they are in the cocktail bar, main restaurant or private dining room, will be able to marvel at beautiful works of art. The restaurant interior is reminiscent of art deco ocean liners, recreated in a decidedly contemporary fashion, while the private dining room features a spectacular oversized painting by renowned Vancouver artist Shannon Belkin. Alamo Queen St - 226 Queen St , Ottawa, ON. Avis Avis Constitution Square - 345 Slater Street, Ottawa, ON. Avis Avis - Ottawa, On - 449 Gladstone Avenue, Ottawa, ON. Avis Opening September 1 2016 - 96 Rue De Lhotel De Ville, Gatineau, QC. Avis Hull Pq - 725 Boulevard De La Carriere, Gatineau, QC. Budget Constitution Square - 345 Slater Street, Constitution Square, Ottawa, ON. Budget Somerset - 443 Somerset Street West, Ottawa, ON. Budget Gatineau Centre-ville - 96 Rue De Lhotel De Ville, Gatineau, . Budget Hull - 725 Boulevard De La Carriere, Gatineau, . Enterprise Downtown Ottawa - 355 St. Patrick St , Ottawa, ON.